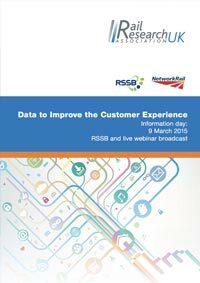 In March 2015, RSSB ran a competition to fund feasibility studies to investigate innovative ways of using data to improve the customer experience, exploring themes such as accessibility, comfort and security, information technology and data sources. On this page you can find information about the competition and launch event. Information: what do passengers need? In this session, we will look at what information passengers need to complete a seamless end-to-end journey; how they prefer to be kept informed and which media would deliver the information they want in the most efficient way. This session will consider TfL’s use of smart ticketing and how they use customer data to understand travelling behaviour and improve the customer experience. Can rail be digitally inclusive? In this session, the speaker will discuss how data can be used to increase the confidence of disabled users with rail travel in order to make it more accessible. The two presentations that follow will explain how other sectors, which also deal with an abundance of data and information sources, have tackled similar problems to the ones the railway is facing with regard to data aggregation, analysis and reporting practices in order to get more value from available datasets. What lessons can be learned?